Ham Manor Golf Club is delighted to be playing host to an International Blind Team of golfers, captained by HMGC member Andy Gilford (pictured above). The match against HMGC’s Scratch Team will be played at the Club on Saturday 13th April and already the banter has started. The question is, can eight of Ham Manor’s finest golfers outwit members of England and Wales international Blind Golfers team over 18 holes? The international team is made up of the current World Champion, British Champion and English Champion to name but a few. It is hoped there will be a good number of members present on the day, to support what will be a very special occasion. Bragging rights will be all important and this may become an annual event! The team will include Jason Bastable from Farnham who is the current ISPS Handa Blind Golf World Champion, he is also current reigning England & Wales Order of Merit Champion for 2017-2018 season, which included winning the Primary Club England & Wales Blind Golf Matchplay and Lawrence Levy British Masters. Jason Heathfield is from Eastbourne and will be guided by one of our members. Jason is the current ISPS Handa British Open Champion won at Cardrona GC Scotland last year. He was with the RAF and had to leave when he lost his sight. He also represents injured servicemen through BattleBack, a charity for veterans to play golf around the world. Danny Daniels is an elderly gentleman guided by his wife Diane, who has joined blind golf over the past couple of years. Andy Gilford, World Ranking 4 (B2 category) European 2nd, started playing blind golf with England & Wales Blind Golf in 1998 and during the 4 years he played he had a lot of great experiences winning the British Open in his first year at Broadstone Golf Club and Captaining the England & Wales Organisation and International team in 1998. Andy then packed in playing for 10 years, and came back to taking up the game in 2012 with his wife Mel guiding. They have played in the last 3 Vision Cup Teams and represented England & Wales Blind Golf in matches against the Scotland. Andy’s home club is Ham Manor Golf Club, Worthing, England. The club and members have supported him since becoming a member, both on and off the course. Andy is coached by Club Pro Jon Nicholas, who has helped him over the last year rise back up the world rankings, securing his place in the Rest of the World Vision Cup Team. He has also played in sighted competitions and has represented clubs in sighted team competitions. Andy has no central vision and can make out a tiny part of the ball, but no detail. He relies on people guiding for him and spotting his ball on the course as he cannot see it once it is struck. Andy and Jason have been named in the ISPS Handa Vision Cup to be played at Portmarnock Golf & Links in June. This is the Ryder Cup of Blind Golf and is played between the Rest of the World Team and North America. To be selected you have to be in the top 4 players per category in the world. This year has 4 players from Sussex playing in the team, which is some achievement for Sussex Golf considering all the countries around the world that play blind golf. The match has been played on 3 occasions so far (held every 2 years) and the previous matches have been played in America, Italy & Canada. Hopefully we can all keep the cup out of the Americans’ hands as they haven’t tasted success yet!! Andy says the main thing his team wants to get out of the match against the Ham Manor Scratch Team is for it to be a great day and also show the club members and spectators what can be achieved against all odds. 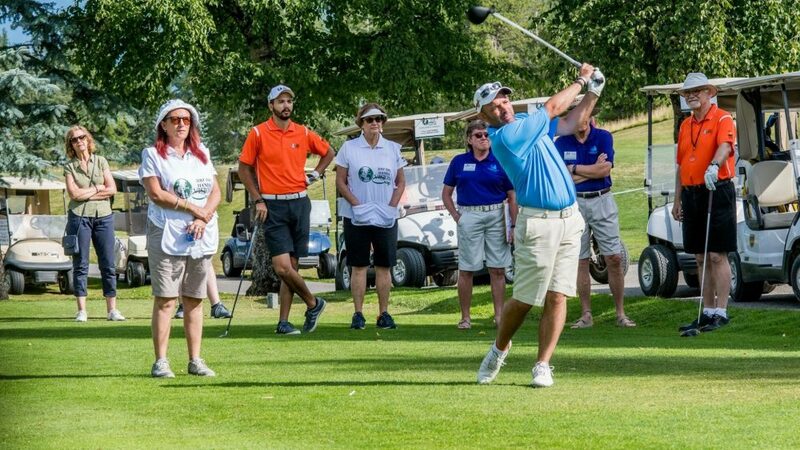 Blind Golf has given him some amazing opportunities in life and helped him overcome his disability. Any member losing their sight will find it hard to accept, but the guys will show how you can still compete and also get opportunities in life which the normal club member will never get.